Scans of the brain cells of rats are helping scientists to understand what happens in the mind as the body gets older. The study backs up theories which suggest that physical changes in the brain mean that an old brain finds it harder to "learn new tricks" than a younger one. The findings could eventually contribute to treatments for disease - and help patients whose brains are failing to develop in the normal way. The scientists, from three universities in the US, were trying to look at how the brain formed connections between different cells. It is thought that making these connections are key to the way that the brain develops and "learns". The connections are not fixed - the brain has the ability to rearrange them, although the factors that control how and when it does this are still poorly understood. What the US scientists found was that, in one brain area at least, as the brain of the rat aged, it seemed to lose the ability to carry out these changes quite so often, and many of the junctions of the cells become more rigidly fixed. The finding backs up theories which suggest that the "plasticity" or flexibility of the cells in the adult brain is far less than in the brain of a child. For example, an animal deprived of sight in one eye for an extended period in childhood becomes blind in that eye. However, restoring the sight stimulus which the animal is still young could lead to recovery - whereas in adulthood, no recovery is possible. The young animal is able to make new connections to take advantage of the situation. 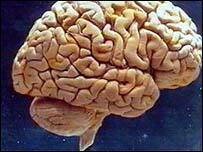 A British-based researcher said that the research, published in the journal Nature Neuroscience, was useful to scientists. However, Dr Stanislaw Glazewski, of Keele University, said that other recent research had found that in certain areas of the brain at least, this "plasticity" appeared to persist even into adulthood. "This is such a complex area," he told BBC News Online. "We believe that this has some impact on learning and memory. "However, if, as some do, we believe that Alzheimer's disease has something to do with reduced plasticity, then perhaps one day this kind of research could help find a way to boost memory. He said that understanding plasticity could also produce new strategies to tackle problems such as phantom limb pain - which happens when the brain still believes that a limb is present, even after amputation. He stressed that much more research needed to be done before the practical benefits of such early research might begin to emerge.